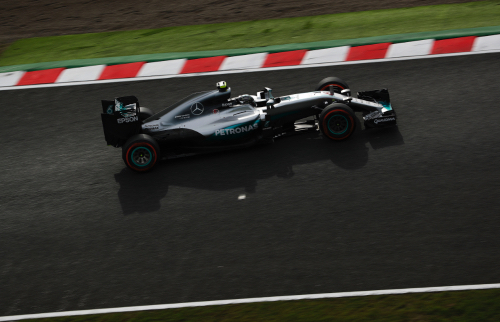 Nico Rosberg was fast from the moment he first steered his Mercedes out onto the Suzuka track for the opening practice session for the Japanese Grand Prix. He earned the pole and he was still ahead at the end of the race which he won in convincing fashion from pole position. "The whole weekend went really well from the word go," Rosberg said after his ninth win of the season and his fourth in the past five races. "Just felt good in the car, found the right balance and all the way through to qualifying. Got that lap done and then the start went well...just everything went well. Just controlling the pace and the gap to Max (Verstappen) in the race. Perfect weekend really. Really happy with that. To win on this legendary track as well." Max Verstappen earned his sixth podium of his career by finishing second in his Red Bull. Lewis Hamilton qualified second, dropped to eighth and finished third in his Mercedes. Several hours after the race, however, Mercedes filed a protest against Verstappen, saying he had driven in an erratic and dangerous manner and had forced Hamilton to take evasive action at Turn 16. However, as both drivers had left the track, the matter was deferred to the next race, the United States Grand Prix. Mercedes then withdrew its protest in the interest of the sport so that the results of the race would not be in limbo the next ten days. Rosberg had qualified on pole with a time just 0.013 of a second quicker than Hamilton. Red Bull's Verstappen and Daniel Ricciardo occupied the second row of the grid after penalties for the Ferrari drivers dropped Sebastian Vettel to sixth and Kimi Raikkonen to eighth in the lineup. Sergio Perez (Force India) and Romain Grosjean (Haas) filled the fifth and seventh slots on the grid, while Nico Hulkenberg (Force India) and Esteban Gutierrez (Haas) rounded out the top 10. When the red lights went out to start the 53 lap race, Hamilton had a slow getaway and dropped to eighth. "I made a mistake," Hamilton said. "I got too much wheel spin." Rosberg got out in front and led lap 1 ahead of Verstappen, Perez, Vettel, Ricciardo, Hulkenberg, Raikkonen and Hamilton. Vettel was on the move, passing Ricciardo on the opening lap, and taking third from Perez on the start of lap 3. "We had a very good start and made good progress in the first two laps, passing Ricciardo and Perez," Vettel said, "and then we were faster than Verstappen. I think today we had the second fastest car." By lap 5 Rosberg had a 3.5 second lead over Verstappen. It took Hamilton seven laps to move into seventh. He then started to close in on Raikkonen who was chasing after Ricciardo. As the tenth lap was completed, Verstappen, Ricciardo and Grosjean all pitted, and switched their medium compound Pirellis for the hard compound slicks. Hulkenberg and Gutierrez stopped a lap later for the same compound. Rosberg pitted at the end of lap 12 as did Vettel, Perez and Raikkonen. Hamilton came in a lap later for the hards. "We're seeing a soft-hard pattern of tire usage for top eight so far, who seem to be on course for a two-stop strategy," Pirelli tweeted. All those who had pitted now had to work their way past Williams teammates Valtteri Bottas and Felipe Massa who were on the medium Pirellis and hadn't stopped yet. After 16 laps, Rosberg was 3.0 seconds ahead of Verstappen who in turn led Vettel, Hamilton, Ricciardo, Bottas, Raikkonen, Perez, Massa and Hulkenberg. The Williams drivers eventually faded back, so Bottas was ninth and Massa tenth. The latter finally pitted at the end of lap 24. Raikkonen made his second stop after 26 laps for a set of the hards. Bottas did his first stop and got the same tires. Verstappen came in after 28 laps for more of the hard compound Pirellis. Hulkenberg stopped for the medium tires. Rosberg was in a lap later for more hards. Perez got the mediums. Vettel led lap 30 ahead of Hamilton, Rosberg, Verstappen, Ricciardo, Raikkonen and Perez. The leader was complaining about lapped traffic, specifically Pascal Wehrlein. "It's ridiculous, I mean it's ridiculus, I lost a second for nothing. ****!" Vettel ranted over the radio. Ricciardo pitted after 32 laps for another set of the hard compound. Hamilton stopped as well for the same. Vettel came in for the softs after 34 laps. A gamble, then, for Ferrari. "Max Verstappen came in as soon as he could to maintain track position, which worked well for him," Vettel said. "We tried to go on the softer tire in the end, which initially we thought would work well, but then we had too much degradation and we were falling off this group. It is always easy to criticize, and I am sure there are many 'experts' that knew better, but on the pit wall as well as in the car, I was keen to go for this strategy so to extend the second stint. It's a fact I lost big chunks of time with the blue flags." That put Rosberg back out in front on lap 35 ahead of Verstappen, Hamilton and Vettel. The Ferrari driver chased after Hamilton but couldn't catch him. "He's pulling away, pulling away on the straights," Vettel radioed. Hamilton was also closing in on Verstappen. The gap was 4.0 seconds after 40 laps, 2.5 seconds a lap later, 1.0 seconds after 44 laps, and 0.6 seconds after 47 laps. Verstappen complained that lapped drivers were not observing the blue flags. The battle for third went on, but Hamilton couldn't close in that final bit on Verstappen. On lap 50 the order was Rosberg, Verstappen, Hamilton, Vettel, Raikkonen, Ricciardo, Perez, Hulkenberg, Massa and Bottas. Hamilton had a real go at Verstappen as the end of 52 at chicane, but Hamilton had to take the escape road. "Max moved under braking," Hamilton yelled. After the race, Hamilton was asked about Verstappen's defensive moves. "It doesn't really matter now," he said. "It's done and we move forwards." Verstappen saw Hamilton coming in his mirrors. "Already the laps before he was closing quite a bit," Verstappen said, "but I saw already out of T14 that he had a good exit so yeah, I was using a bit of energy and I defended into the last chicane. All good." So Verstappen held on to second place on the road. "The car was feeling quite good," he said. "I was trying to follow Nico a bit and I think in general we did a great strategy, so the car was working well and, of course, Lewis was closing up a lot. At the end of the race he was pushing really hard and I knew he's fighting for the world championship, so you're not going to do crazy things, of course. But I think in the end it was all good. I managed to keep my tyres alive." Hamilton passed a lot of cars on his way to third. "In the middle stint, the car felt good," he said. "Generally the car felt great throughout the race, so it wasn't really a problem and I'm not really quite sure if I was overtaking back markers or not but I was just overtaking whoever I could. Had a good run there. Fought hard at the end but just didn't make it." The Ferraris wound up fourth (Vettel) and fifth (Raikkonen). "After a good qualifying yesterday, the issue with the gearbox and the consequent starting position change was not ideal in this kind of track," Raikkonen said. "Obviously there's a lot of disappointment, as we had a good car and if we could have stayed in front we would have fought with more free air and with a lot of speed. "I had a good start but then I got stuck behind other people: it was really tricky to follow other cars and it affected quite a bit the behavior. It was also difficult to stay close to them and attack them. Once we got past them and I was on my own, the car was quick and handling well. For sure today we were fast enough for a better result. Unfortunately that's how it goes." Malaysia GP winner Daniel Ricciardo finished sixth in Japan. "Today wasn't a very exciting race for me" he said, "and unfortunately it just wasn't my day. Kimi's (Raikkonen) penalty was a bit of a bummer for us as it put us on the wet side of the grid and that compromised the start. I don't think my launch was too bad but Lewis obviously struggled to get off the line and I had to go around him through the wet and that made me lose a place to Sergio (Perez). "Seb (Vettel) had a good exit out of Turn 14 and made quick work of me on the straight, then he caught Perez quickly as well. That sort of shaped the first stint for me. We struggled to stay close to the cars in front as we couldn't follow them in the dirty air, and we didn't have the straight line speed to make an attack. We struggled in the traffic and fell behind the eight ball. In the final stint towards the end I had a clear track and I was able put in some good laps but it wasn't enough." Force India's Perez and Hulkenberg finished seventh and eighth and ahead of Williams drivers Massa and Bottas. That means Force India has extended its lead by seven points for fourth place in the constructors' championship over Williams. So now it is on to Texas and the United States Grand Prix which will provide Hamilton a chance to claw back some points from Rosberg, and to stop Rosberg winning again in convincing fashion. "I'll give it everything I've got, as I did in the race and we'll see what happens," Hamilton said.